We’ve been planning a revamp or makeover on our Dining Room for some time now and I’ve decided to run a series of posts to let you see how we get on. We are notoriously slow at DIY so it may take some time, but I’ll post every few weeks to show you our progress. The Dining Room is a multi function room. Yes it has had a table and chairs in there (nothing there currently) but it also houses the computer, the girls’ toys and all of my business paperwork and many of the resources I use too. It’s had CD and DVD storage in there for a long time and it just got messier and messier. The girls are growing up and store many of their toys in their bedrooms, but will bring toys downstairs. We do try to keep the living room a toy free zone if we can, so they tend to play in the Dining Room and can often feel a bit isolated. So the plan is to turn the space into more of a Den. It will still have a dining table, just a smaller, extending type, and will still house a fair bit of storage style furniture, but we’ve already put a sofa in there to make it more comfortable and added a TV. The girls like to play on the Wii occasionally and Mr Demolition is addicted to the Grand Prix, which not everyone else is, so a spare TV hangout room is ideal. Most of the CD’s have been transferred to a pc, the DVD cases are all stored in the loft and the dvds themselves are in a holder. We sorted out the piles and piles of paperwork, business resources and kids pens and colouring books and managed to hold it onto just 2 bookcases instead of 4! It just shows how much you keep that you really don’t need. My tip for this kind of project is ‘be ruthless’! I’ve got lots of exciting ideas to try out, whilst keeping an eye on the budget which isn’t huge. It will take some time as we need to save to buy the furniture but I’ve already nabbed some bargains which I’ll share with you later this week. For now, take a peek at the room in its current state. I warn you, it’s not pretty! You saw the new sofa in the video? Here’s my first bargain for the Dining Room Makeover. This one is from Dwell and we picked it up in the sale for just £499. I think that’s a real bargain! 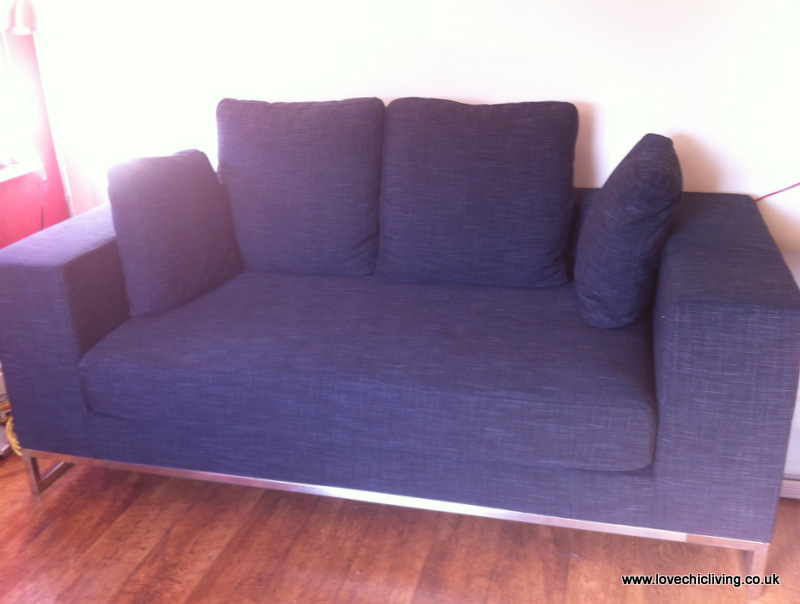 It’s incredibly well made, very comfortable, modern and stylish. I like that it’s quite compact too and fits into the space really well. The charcoal colour is ideal for co-ordinating with the rest of the decor, although I have to say, it does show all bits of fluff etc. At the moment the girls aren’t allowed to eat on there (when the new table is in place that rule will be easier to enforce) and if they do, I know it will be filthy in no time. Come back again soon to see some progress on the makeover, and let’s hope I can transform this dining room into the space that the family really needs. If you would like to join in with my brand new Love Interiors Linky then do link up below. It doesn’t have to be a makeover project, perhaps you’ve spotted something fabulous in the shops or on the internet, maybe you’ve made something wonderful for your home, or simply moved the furniture around and you love the end result. Whatever it is, if you love your interiors then share it here for everyone to see. Once you’ve linked up, go and take a look at some of the others and leave some comments. Please do grab the ‘Love Interiors’ badge from my sidebar and add to your post. We’ll be back again in a fortnight to share more interiors, and I may even showcase a few posts that I love! Do you know, I didn’t see the the video before, no idea why, just watched it. Think I need to be brave and give that a go. Maybe at the end! It’s a brave woman who sells storage items. Hope you can fit everything back in. Love the sofa. We have the same issues with our dining/play/my office room. I moved my desk downstairs to allow me to work round the kids which works, but the multi purpose use of the room means it is always a mess. Will watch with interest! What a lovely idea for a linky. Thanks for inviting me to join in. I’m looking forward to hearing more about your project.